Nico de Jong (1954) graduated from Delft University of Technology, The Netherlands, in 1978. He got his M.Sc. in Applied Physics in the field of pattern recognition. In 1993 he received his Ph.D. for "Acoustic properties of ultrasound contrast agents.” Since 1980, he is staff member of Biomedical Engineering of the Thoraxcenter of the Erasmus University Medical Center, Rotterdam. In 2015 he became head of the Acoustical Wavefield Imaging group of the Technical University Delft (60%). He is founder and organizer of the annual European Symposia on Ultrasound Contrast Imaging (see www.echocontrast.nl), held in Rotterdam and attended by approximately 175 scientists from universities and industries all over the world. He is on the safety committee of WFUMB (World Federation of Ultrasound in Medicine and Biology), assiociate editor of Ultrasound in Medicine and Biology. Over the last 5 years he has given more than 30 invited lectures and has given numerous scientific presentations for international industries. He has been Promotor of 21 PhD students and is currently supervising 11 PhD students. 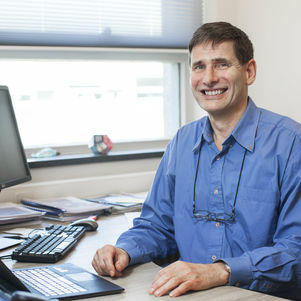 Since 1 October 2011 he is professor in Molecular Ultrasonic Imaging and Therapy at the Erasmus MC and the Technical University of Delft and the first Medical Delta professor who was officially installed in June 2014. He is head of Acoustical Wavefield Imaging at the Imphys Department of the Technical University of Delft (60%) and working at the ErasmusMC in Rotterdam (40%).